The Chilika Lake is considered to be one of the biodiversity hot spots of the country. Some species that are rare, vulnerable and endangered inhabit the lake area for at least a part of their life cycle. 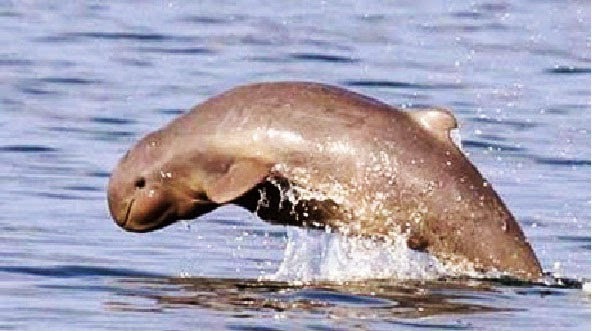 Irrawady dolphins and the Barakudia limbless skink are prominent among all. The lake, familiarly known as Chilika Lagoon has Nalabana Island spreading over 15.53 sq.km, which has been recognized as a wildlife sanctuary by the Government of Orissa in 1987. The Govt. of India has designated the Chilika Lake as a Ramsar site in 1981 for its water –fowl habitat. You can visit the entire stretch of the lagoon from Chandraput to the New mouth and Satpada. The major attractions include Nalabana Bird Sanctuary, the Magarmukh area, the New Mouth and the temple on Kalijai Island. It will be a heart throb experience to see Flamingos and Pelicans at close range in the Nalabana Island. The Nirmaljhar waterfall, located nearly 12km from Chilika lagoon is a blissful site of serenity. The sunrise and sunset in Chilika is one of the imperturbable sight which draws attention of many tourists. 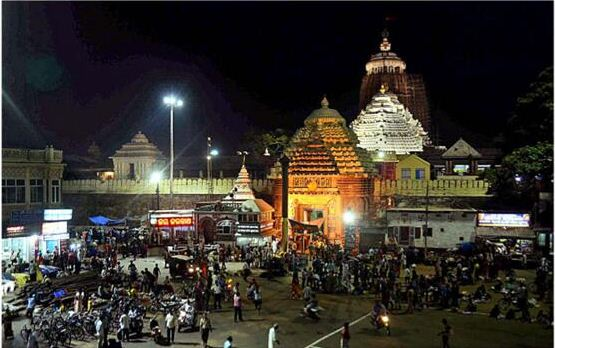 The tourism industry also thrives in the region of Satpada which is located on eastern side of Chilika Lake. The place is surrounded by coastal lagoons on three sides for the visitors to enjoy boating and recreational activities. 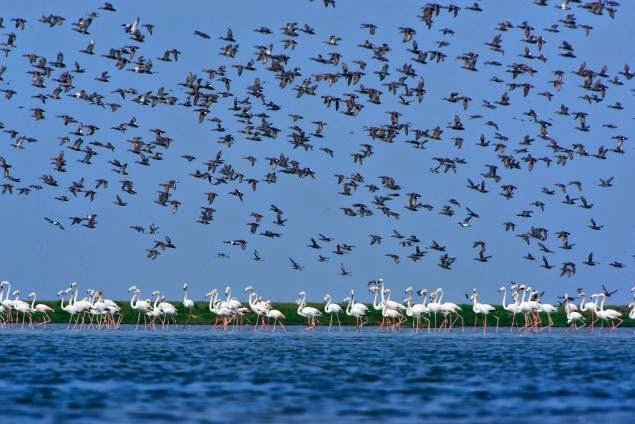 Surveys reveal that Chilika Lake is the largest wintering ground for migratory birds coming to India. During the peak season, nearly 160 species of birds invade this region. They come from as far as Ladakh, Himalayas, Caspian Sea, Lake Baikal and other remote places. Graylag geese, Jacana, Herons and Flamingos, white bellied sea eagles, Gray and purple Herons, Indian Roller, Storks and white Ibis, Brahminy Ducks, Shovellers and Pintails, Spoonbills and many more are among the birds who migrate to this serene land for nesting. A bird census conducted in 2008 reveals, 9, 00,000 migratory birds of which 4, 50,000 were sighted in Nalabana. Rare birds reported in the lake are Dalmation Pelican, Pallas’s fish eagles , Asiatic Dowitchers, the very rare migrant Spoon-billed Sandpiper and Spot-Billed Pelican. Chilika Lake can be considered as lifeline for the dwelling community. Many endangered species are found. Being an estuarine lagoon, it supports a unique combination of brackish, marine and freshwater species. Not only wildlife, tourists also enjoy beaches and boat trips to the Island of Kalijai, which renders the local people with great employment opportunities. What more you can expect? A motored boat, eco-friendly by its appearance, is handled by a local boat man amidst picturesque environs. To add to its secluded nature, the soothing water of the lake disappears as the journey combats. This allows many hours of most treasured views. A quaint aroma of pure harmony and happiness is abroad the marvelous lake designed by years of change. Soft winds caress your neck as one nears the slow- sloping depressions covered by tanzanite colored water. For some never expected reason, one feels a whisper tone to maintain the perfect cohesion with the outdoor temple on Kalijai. Tourists awaiting eagerly to come back to the shore present themselves with a hearty smile and you feel the warmth of the divine island, which is the abode of goddess Kalijai. The return journey promises the site of rare Irrawady dolphins as you move towards the mouth of the lake. There are 158 of them as per the census conducted in 2010. The alkaline water is as still as a photograph where one can hear even the ripples made from the boat while it amplifies into this placid lake. Often you can see a rainbow stretching across the sky as water turns to vapors by the sun’s solar rays. The grassy patch seems like a neon light around the shore of the entire lake. Cattle grazing on the banks, is a temperate scenery. The Chilika lagoon separates the two point of islands from either side. The Rajhans Island beach serves like a boundary to the lake. The open air and natural flora and fauna are an attraction of eco-tourism. Once atop the deck on the boat overlooking picture on the horizon, seeing the birds and the beauty, one will forget all worries and anxieties. This almost perfect pious lake is a must-watch for all tourists. If you are on a visit to Puri Jagannath Temple and plan to see the tourist attractions near Puri, you must visit one of the India’s largest lakes to explore the wildlife of Odisha.